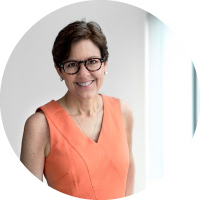 As the world’s first Chief Content Officer, Ann Handley speaks and writes about how you can rethink the way your business markets. Cited in Forbes as the most influential woman in Social Media and recognized by ForbesWoman as one of the top 20 women bloggers, Ann Handley is the Chief Content Officer of MarketingProfs, a training company that empowers marketers internationally with the skills they need to drive success at their companies. Ann is a speaker, author, and member of the LinkedIn Influencer program. She is the author of the Wall Street Journal best-seller on business writing, “Everybody Writes,” and the co-author of the best-selling book on content marketing, “Content Rules: How to Create Killer Blogs, Podcasts, Videos, Ebooks, Webinars (and More) That Engage Customers and Ignite Your Business.” A pioneer in digital marketing, Ann is the co-founder of ClickZ.com, which was one of the first sources of digital marketing news and commentary. Eventually I learned to spell “writer” and I became a writer, journalist, editor and (when the Internet happened) a content publisher. I worked at newspapers, magazines, and became the first Chief Content Officer at one company (ClickZ, which I co-founded in 1997) and now hold the title at another (MarketingProfs). I write books. I speak all over the world. I love helping other people up their marketing game. Marketing writing – You can certainly be a writer without being a marketer. But I don’t think you can be a marketer without being a writer – or you can’t be a very good one. Good writing is the heart and soul of good content – and it’s also the liver, lungs and central nervous system. When I say “writer,” by the way, I’m talking about the ability to express yourself with brevity, clarity and style. Those are things valued in almost any professional, but especially in marketing and communications. Empathy – “Empathy” is one of those words (like “transparency” and “authenticity”) that is quickly earning a spot on the marketing buzzword Bingo card. It’s overused and (often) abused. But it’s truly the heart of all great marketing. (And great writing.) Marketers need to frame their marketing and bigger story in a way that offers real value for the customer. Our marketing programs need to be based on real insight – not just ill-considered hunches or (worse) clichés? Get a deep understanding of your customers (and their problems, hopes, dreams). And that takes time. Are you surprised that I didn’t say AI? Or technology? Or [insert some amazing tool here]? Tech is awesome – and I love how AI is increasingly helping marketers refine their programs. But the truth is that great marketing starts with a human marketer having honest empathy for an actual customer. I just got home from Content Marketing World. I’ve spoken at that event every year. For a lot of us, it feels more like homecoming than a business event. One thing that struck me while I was in Cleveland is that not only has the content marketing industry grown up over the past seven or eight years. But so many of the speakers have, as well. In other words, a great thing about our industry is that so many of us so-called marketing influencers have literally come into our own as “thought leaders” during these past several years. So people like Ardath Albee, Joe Pulizzi, Jay Baer, Lee Odden, Robert Rose, Andrew Davis, Pam Didner, Andy Crestodina, Doug Kessler and so many others have become friends but also a kind of collective mentor to me: As they have evolved their thinking and expertise, they’ve both inspired and challenged me to evolve my own, too. Who needs one influencer when you can have content marketing’s Navy SEALs? Avinash Kaushik. Because his brain works 100% differently than my own. (Or at least 90% differently.) Yet I love reading his stuff because he makes it accessible. Also, he’s a wonderful, spirited writer. You can hear his voice when you read him. And Seth Godin. Because I respect the heck out of his ability to always push himself (and us) forward, and I love his commitment to write and publish every day. I read way more non-business books than I do business books. So my influencers include decidedly non-marketers who are nonetheless great writers and communicators: E.B. White. Mary Norris. Anne Lamott. Chimamanda Ngozi Adichie. We could be here for a few more hours. How much space do I have? I am drawn to brands that use humor, or that don’t take themselves too seriously. I like brands that use a strong tone of voice in their writing: you’d recognize their writing even if the logo went missing. I also like brands that approach their marketing as training. That ask: What would our customer need from us? Podcasts, webinars, whitepapers, speaking opportunities, all of the above!